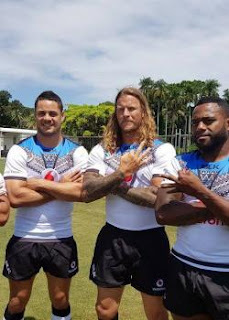 Vodafone Fiji Bati and Gold Coast Titans fullback Jarryd Hayne anticipates a great outing when going "toe to toe" with Rugby League giants in the Tri-Nations and 2017 Rugby League World Cup (RLWC) on Saturday. "We have got a massive forward pack and it is going to be great going toe to toe with the heavyweights. We have got Australia and Papua New Guinea and our forward pack is as big as they are, but we just lack the experience, but I am sure the boys are going to learn a lot," Hayne said. He said playing against the best in the world would be an excellent learning curve heading in to the 2017 RLWC. "They are the best for a reason and it is going to be awesome. I have almost played with half the boys in the Kangaroo team and it is going to be fun. I am really looking forward to it. "We have been talking about it since Origin (State of Origin) of them coming over here and it is just great for rugby league." Hayne said the game had grown from strength to strength since 2008 and it was a good to see how far the game had developed. Meanwhile, Fiji Bati and Melbourne Storm winger Suliasi Vunivalu is relishing the chance of playing here at home in the Tri-Nations at the ANZ Stadium, Laucala Bay, Suva on Saturday. "All the boys are really excited to play in the upcoming Tri-Nations. And we hope that all the Fijians will enjoy watching the game this Saturday," Vunivalu said. But one thing he will be banking on is the undoubted support from his friends and families in Bagasau, Toorak, Suva. The community of Bagasau have always been ardent supporters of Vunivalu in all his games, whether playing for Fiji or the 2017 National Rugby League (NRL) Premiers the Melbourne Storm. "They have been there for me and supporting me from the beginning and I know they will be out there in full force supporting not only me but the whole team also."